1. Place chopped chicken in bottom of 4-quart slow cooker. 2. Wisk together soy sauce, sugar, vinegar, garlic and ginger. Pour over chicken. 3. Cover and cook on low 4-5 hours. 4. Remove chicken. While slow cooker is still warm (or left on the warm setting if your has one), mix cornstarch with warm water until smooth. Slowly add into sauce in the slow cooker to thicken, mixing as you add. 5. 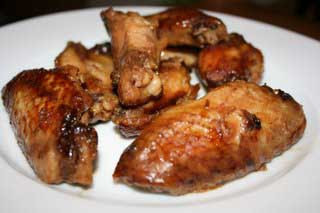 Return chicken to slow cooker and stir to coat in sauce. Making teriyaki is a simple process of reduction. Mix 2 parts sake, 1 part mirin, and 1 part soy in a sauce pan, and turn the stove to medium heat. 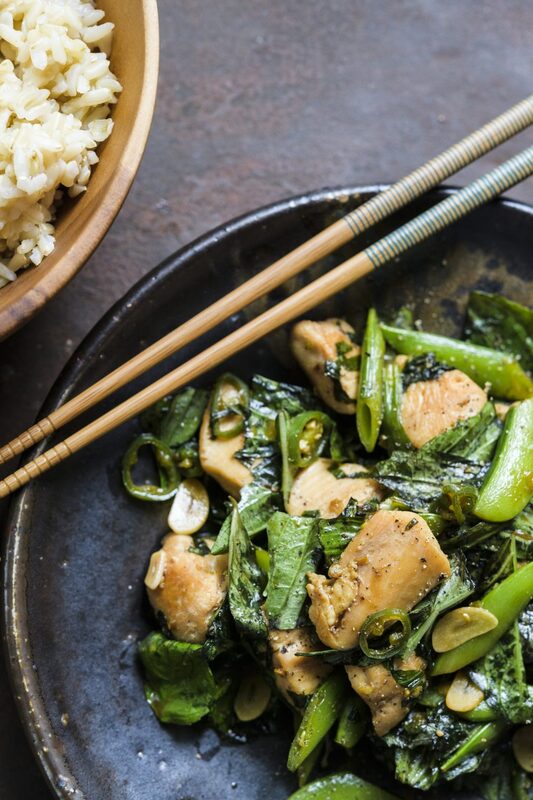 You have to reduce teriyaki more than you think; the goal of reduction is to remove water from the mixture to concentrate the sugar, salt, and umami present in all of those ingredients. We want our teriyaki to be seriously syrupy and thick. Once it starts to noticeably reduce, turn the heat down, since sugar will burn pretty easily at this point. You know what they say: Better safe than burning your teriyaki (aka sorry). Teriyaki is a very simple Japanese condiment that usually consists of just three ingredients: Sake (rice wine), mirin (sweet, low-alcohol rice wine), and soy sauce (the salty, fermented soy bean-based condiment you know and love). Once you make teriyaki sauce, you can keep it for weeks in the fridge. In a large skillet, heat oil over medium heat; add the chicken; brown lightly on all sides; transfer chicken to a plate. Add the onion, bell peppers, and mushrooms to the skillet; season with salt and pepper; stir/saute for 5 minutes or until softened; remove pan from heat. Layer half the vegetables and half the pineapple chunks over the bottom of a 2 to 2 1/2 quart lightly greased casserole dish. Arrange chicken pieces over the vegetables and pineapple. In a small bowl, mix together the La Choy soy sauce and Sue Bee honey; brush the chicken with this mixture. Layer the remaining vegetables and pineapple over the chicken. Mix the pineapple juice and wine together; pour evenly over the top. Cover and bake in a 350° oven for about 1 hour or until the chicken is tender and cooked through, juices running clear. *La Choy soy sauce is a salty, not sweet variety of soy sauce. 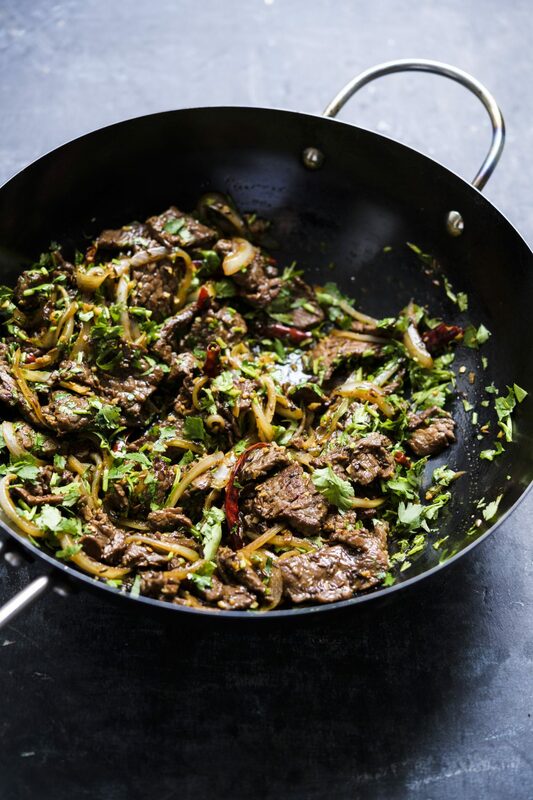 Use pre-sliced beef stir fry strips to make it a little quicker. Slicing the green peppers into strips instead of chopping them and adding the peppers when the dish is almost done though or they get really mushy. Easy and delicious! Try adding a couple cloves of chopped garlic, and a few dashes or Worcestershire sauce. Slow Cooked Mongolian Beef is a simple version of the Chinese restaurant classic. A delicious sauce is added to the slow cooker pot along with fresh vegetables, then simmered. Thin strips of beef are then added and the whole thing is slow cooked until the meat is tender and melt-in-the-mouth delicious. Serve with rice and more vegetables. Place garlic, ginger, onion, carrot, bell pepper, brown sugar, chili sauce, soy sauce, and water in slow cooker. Stir thoroughly. Cook on HIGH for 1 hour. Thinly slice beef against the grain. Evenly coat beef by dredging each piece into the flour/corn starch. After 1 hour of cooking sauce, place coated beef into the hot sauce. Stir making sure all meat is covered with sauce. Cook another 2 hours on HIGH. Option: Sear coated beef flank steak (2-4 minutes) in 2 teaspoons of olive oil in a large skillet over medium-high heat. Then place all ingredients into slow cooker. Cook on LOW for 4-6 hours. Sweet and tangy flavor. It came out perfect, not too soggy after cooking for so long. With the crock pot you don’t need a wok, and it comes out every bit as good as the local restaurant. There are also even more leftovers! As a family of 4 we had them for days. Preheat oil in a nonstick pan or skillet over medium heat. Whisk together corn starch, salt, 1 teaspoon garlic powder, and pepper. Add the corn starch mixture and chicken to a large zip lock bag. Seal and shake it to coat chicken. In a bowl combine all sauce ingredients and whisk to combine. Add half to the crockpot along with chicken pieces. Cook on low for 4 hours. Immediately before serving, Add remaining sauce to the crock pot and stir gently. Serve with rice. Homemade Chinese hoisin sauce that tastes better than shop bought stuff. Put all the ingredients into a blender and blitz to a smooth liquid. If you don't want to mess around with bones, use chicken thighs. if you have bottled teriyaki sauce, use about 3/4 of a cup, and then 2 tablespoons water in place of sauce. Organic rice paper wrappers are for more than just spring rolls. Because they contain rice rather than wheat or other flours, the wrappers are gluten-free and can be used to wrap all sorts of organic foods. Unfortunately, finding commercially prepared varieties of organic rice paper wrappers is extremely difficult. However, making your own wrappers is a fairly simple process that doesn't require any special equipment. As long as you use organic ingredients, you'll have organic rice paper wrappers. This recipe yields 18 wrappers. Sift together the flour and the salt into a medium-sized bowl. Very slowly, add the water to the flour and salt mixture, stirring constantly as the water is added. Stir until the batter is extremely smooth. Over medium heat, preheat a 5" non-stick sauté pan that has been coated with a thin layer of the cooking spray. Preheat for five minutes. Pour one tablespoon of the batter into the middle of the pan and quickly tilt and swirl the pan in order to spread the batter quickly and evenly. Cook the batter until it appears dry - about two minutes. There is no need to flip the batter over - the layer will be so thin that it will cook through quickly. Gently remove the rice paper from the pan and set aside on paper towels to cool. When you are ready to use the wrappers, remoisten them with a few sprinkles of water. Lay the wrappers on a flat surface. Fill the wrappers with a few tablespoons of your favorite organic ingredients. Fold the two ends of the wrapper over the filling and then roll. Wet your finger in water and rub the edges of the wrapper to seal. Foods rolled in rice paper wrappers can be eaten as is (if the ingredients are already cooked), or deep fried until golden and crispy. Sweet apple dessert - Fill wrappers with organic apples that have been sautéed in organic butter or coconut oil and a dash of cinnamon. Fry rolls in coconut oil and drizzle with organic honey. Asian Vegan Rolls - Sautee diced organic tofu with organic aromatic vegetables such as onion, celery and carrots. Add a dash of soy sauce and some organic cilantro. Fill the wrappers with the tofu and vegetables and roll. Pear-ginger rolls - Sautee organic pear slices with organic crystallized ginger in some organic butter or oil. Add grating of fresh organic nutmeg. Roll in rice paper and fry. Sprinkle with a mixture of cinnamon and sugar. Prawn, pink ginger and avocado rolls - Marinate prawns in a mixture of organic oil, rice vinegar and grated coriander for about 30 minutes. Sautee prawns. Place one prawn on each wrapper, and add slices of avocado, pickled ginger and leaves of cilantro. Roll and serve. Grated vegetable and rice noodle rolls - Grate carrots. Slice green onions. Finely chop or grate cabbage. Sliver shiitake mushrooms. Soften rice noodles. Mix vegetables with noodles and add a handful of cilantro. Add a few tablespoons of rice vinegar, two cloves of minced garlic and a pinch of salt. When well mixed, roll in rice paper and serve as is, or deep fry the rolls. Peanut sauce - In a blender, combine ¼ cup organic peanut butter, two cloves of garlic, one tablespoon of sugar, three tablespoons of soy sauce, one tablespoon of sesame oil, ¼ cup of water and two tablespoons of lime juice. Sweet hot dipping sauce - In a small bowl, combine one clove of garlic, minced; ½ teaspoon of chili oil, three tablespoons of soy sauce, two tablespoons of white vinegar and one tablespoon of sugar. Chili oil and soy vinegar sauce - In a small bowl, mix together four tablespoons of white vinegar, two tablespoons of soy sauce and four drops of chili oil. With a little creativity and preparation, the uses for rice paper wrappers are endless. Go ahead - find your favorite organic ingredients and wrap them in organic wrappers. You'll be glad you did. Easy to make. Will substitute chicken for the ham next time. Added some pineapple juice for extra flavor. Will make again for sure.